Hi friend! I hope you’ve been having a splendiferous week. I’m just getting ready to head to Ottawa for a weekend with my family (minus my lame brother who decided not to come), but wanted to share a quick post with you. Since it’s so short I’m making it up to you by giving you 3 recipes in one post. Wooooooo! With all the beautiful sunshine of Spring I would say it’s about time for ice cream season. Unfortunately for my tummy, regular dairy is not my friend. 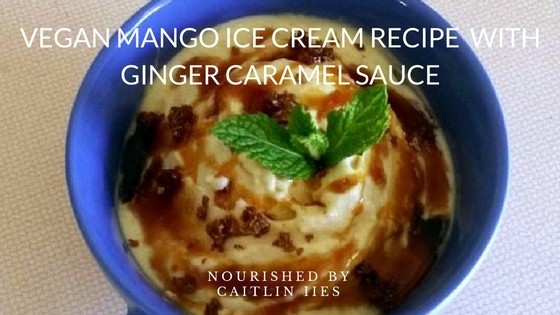 Fortunately, during the CNE program I learned how to use alternatives to regular dairy to make healthy and nourishing treats like this sinfully delicious Vegan Mango Ice Cream with Ginger Caramel. This is my very first ever vegan ice cream recipe on the blog, so you’ll have to let me know how it goes! I tested it out on my roomie last night and she was pretty pumped about it, especially with the ginger caramel. I’m also taking over the Academy of Culinary Nutrition’s Instagram today and I’ll be sharing tons of recipes and fun. So make sure you head on over to check them out and take a peek around. A new session is starting up in the fall and registration is picking up. If you have any questions about the program or want to chat about what you’ll learn, pop me a message and we can connect! If you have an ice cream maker add the base to it, following your model specific instructions before freezing. If no ice cream maker, freeze into ice cube trays, leaving about ¼ cup of the base in the fridge. When ready to serve, blend “ice cubes” with leftover liquid. Top with ginger caramel & candied ginger pieces. Add pureed ginger, water, palm sugar, maple syrup, & sea salt to a small saucepan over medium heat. Once boiling reduce head to low and simmer about 20 to 30 minutes or until sauce is thickened, stirring every couple of minutes. Pour through a thin strainer. Spread ginger pieces out on a piece of parchment and place in the fridge. Store caramel in a sealed container. Thanks for stopping by. Have a wonderfully whimsical weekend!